Turning your attic into a spare bedroom can be a huge bonus for your home. It becomes a perfect space for one of your kids to move into especially if they are already sharing a room with a sibling. It’s a great area for out-of-town visitors to spend the weekend. And if you want to consider earning extra income and attic bedroom be a very attractive space for a potential roommate. Do you find yourself constantly tripping over your children’s toys? Confining those toys to the attic might be the solution. This is a wide-open space that could be adapted with many fun zones for the kids. They can have their own reading nook as well as a corner dedicated to arts and crafts. Small shelves will be able to hold all those errant toys. As the kids get older, you can swap out the toys for a videogame system. The attic becomes a perfect place to go on a rainy day. You might have a collection that has overgrown a shelf. Maybe most of your collectibles of boxed up. 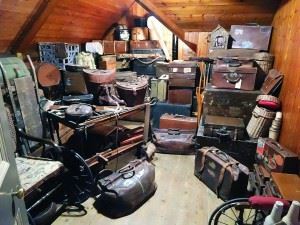 The attic becomes a terrific hobby room. You can create displays for all of your collected items. If building is part of your hobby, then you can easily set up a workbench to construct your items. Before you can make any of those changes in your attic, you first have to get rid of all the rubbish that’s up there. It’s a safe bet that a large majority of what you have in storage could probably be tossed out. Junk King Pittsburgh can provide the manpower and the truck space to accomplish that task. If it takes the crew from Junk King a dozen trips up and down the attic stairs to clear out all the rubbish, then that is what they will happily do. Get started on your attic conversion with a call to Junk King Pittsburgh today. This entry was posted in Junk King Pittsburgh and tagged attic, Junk King Pittsburgh, junk removal on June 30, 2017 by Junk King. Last updated July 1, 2017 .